A small leafed herb that is very popular in French cooking. 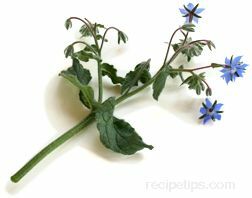 It has a strong, somewhat minty flavor and is available in fresh or dried form. 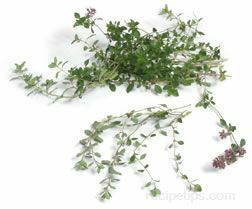 Thyme is used to season poultry, lamb, seafood and vegetables. To store, wrap fresh thyme in a paper towel, place in a plastic bag and keep in the refrigerator. Dried thyme can be stored for up to a year in a cool dry location out of the direct light. Dried thyme should be crushed in the palm of your hand to release its flavor before using. To chop fresh thyme, strip leaves from the stems and gather leaves into a tight, dense bunch. Using a sharp knife, cut across the gathered leaves to chop coarsely. To mince, take coarsely chopped leaves, with a rocking motion start moving a sharp knife blade back and forth across the leaves until they have been cut to the desired fineness.